Ring the alarm. This recipe is intense. It might actually blow your mind. Now, I’ll give you a fair warning – this is NOT my recipe. I found this recipe on Hot for Food’s Youtube channel. Now, I had conflicting feelings about posting a recipe that isn’t mine but I thought I’d share with you that….I’m not a blogging goddess. Shocking, I know! I don’t always manifest crazy amazing recipes out of nowhere. I do a lot of research, read a lot of blogs, read a lot of cookbooks, and articles. I experiment all the time and then there are some times that I follow recipes from cooks and bloggers that I admire to every detail so that I can GROW AND LEARN as a home cook and blogger. My learning and growing process is especially important these days because I am still incredibly new to the way that I eat – due to my IBS and other reasons. It’s helpful for me to find other people who cook and eat similarly so I can grow my recipe and culinary knowledge. ANYWAYS. These cauliflower wings are dank as hell. 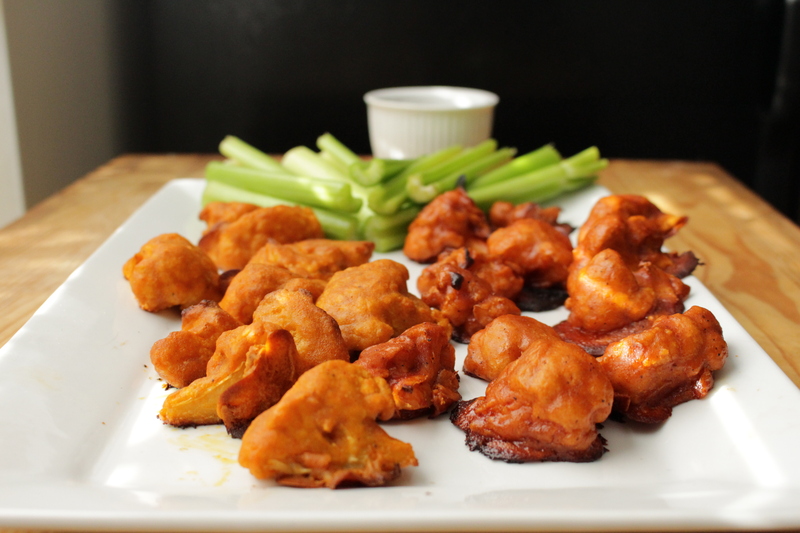 Honestly, I’ve had buffalo cauliflower wings before and it basically tasted like barely-cooked cauliflower with buffalo sauce. Yuck. It was bad. These cauliflower wings are like food angels. They are lightly battered, baked, slightly crispy, and the cauliflower is tender and actually almost mimics the texture of chicken. Truly. I may have seen the gods after eating these. My eyes rolled back into my head and I groaned with ecstasy after taking my first bite. Sorry if that’s sexual. Actually, I’m not. There is no reason for you to try these cauliflower wings. I wouldn’t post someone else’s recipe without reason. After all – I want all of your attention. 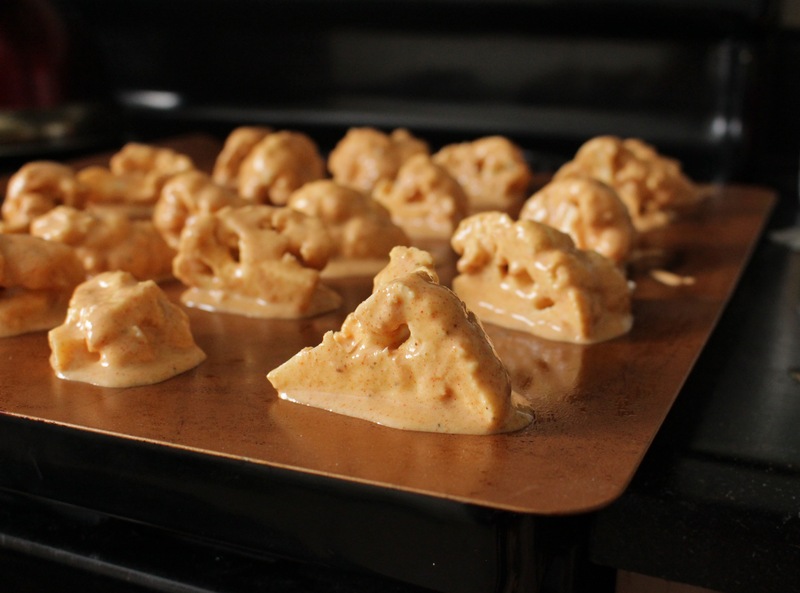 Line baking sheet(s) with parchment paper and preheat your oven to 450 F.Wash and cut cauliflower head into bite sized pieces/florets. Mix all the ingredients (minus the earth balance and hot sauce, this is added separately!) into a mixing bowl. The batter shouldn’t be so thick that it doesn’t drip, but also not so thin that it doesn’t coat or stick to the cauliflower. Dip each floret into the mixture and coat evenly. Tap off the excess a couple of times on the side of the bowl. Lay florets in an even layer on the parchment lined baking sheet without over crowding. Bake for 25 minutes until golden brown, flipping the florets over half way through to get all sides golden brown and crispy. Once the cauliflower is done it’s first bake in the batter, remove them from the oven and put all the baked florets into a mixing bowl with the wing sauce and toss to coat evenly, or you can do this in smaller batches. Then spread all the florets in wing sauce out onto the same baking sheet. Bake in the oven for another 25 minutes, flipping the florets over half way through. 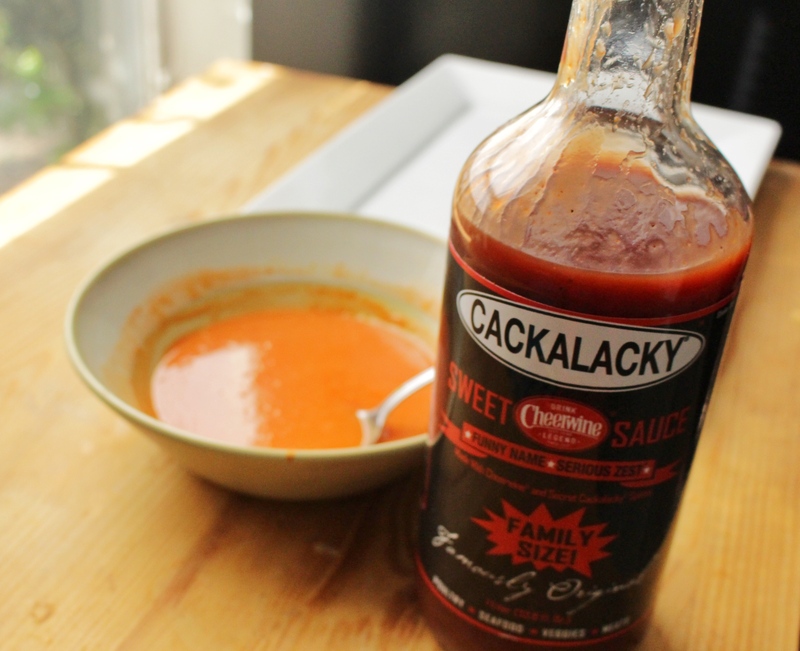 Jae Note: I also halved the cauliflower and dunked them in this barbecue sauce called Cackalacky Sweet Cheerwine Sauce. This sauce is local (literally made 30 minutes away from me) and Cheerwine is a state-original soda that is pretty big North Carolina. It was freaking awesome. THEN. Then, guys, I felt the need to bolster my cauliflower wings by making them into a sandwich. 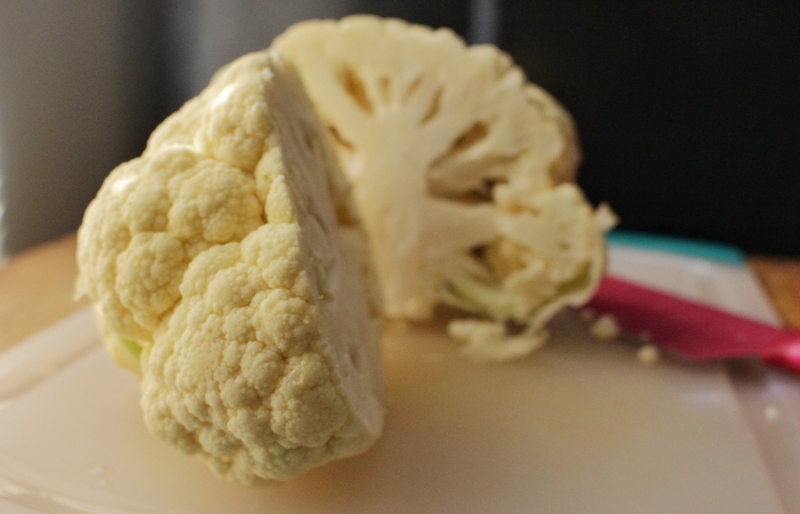 As you all know – I am a ravenous little creature and I need so much more sustenance than just cauliflower, no matter how delicious they are. 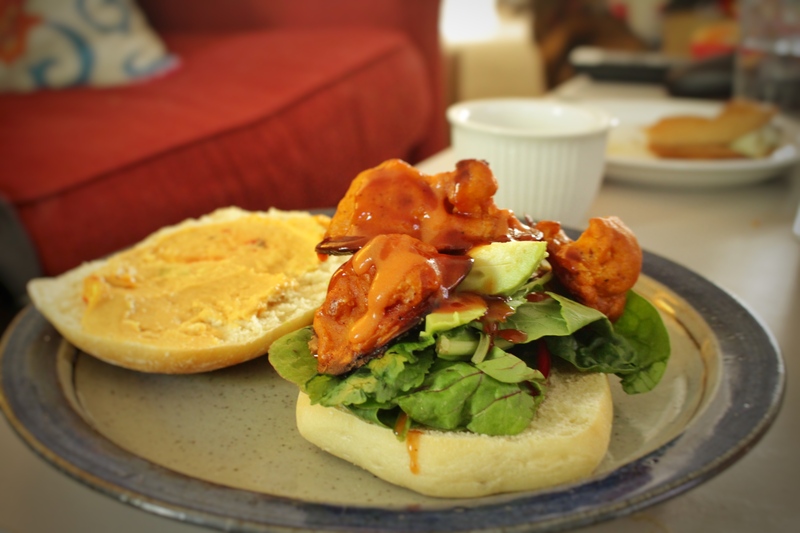 I got this really awesome ciabatta-like bread, spread some sriracha hummus (because sriracha ANYTHING is life) and put some greens and some avocado slices and 3-4 pieces of cauliflower wings and more barbecue sauce on top and crammed that sandwich into my mouth as fast as I could muster. ALSO – furthering why these cauliflower buffalo wings are sent from the gods – my sweet, vegetable-loathing boyfriend actually enjoyed these. HE ATE MORE THAN ONE. In fact, he ate quite a few and I have never felt such smug satisfaction. Thank you Lauren and John from Hot For Food for the miracles you have worked! Ironically, I made these Sunday afternoon while the boyfriend was watching his football games. I’ve never felt so American…and yet, not American, while eating these buffalo “wings” during a football game. This whole buffalo cauliflower wing expedition was such a win. I hope you try these so your mind can explode as well. Urgh, need to jump on this. Looks amazing. Please come live with me. And cook all the vegan stuffs.